photo-eye Gallery Update on Michelle Frankfurter's Destino Back in April we presented an interview and new selection of images from Photographer's Showcase artist Michelle Frankfurter. 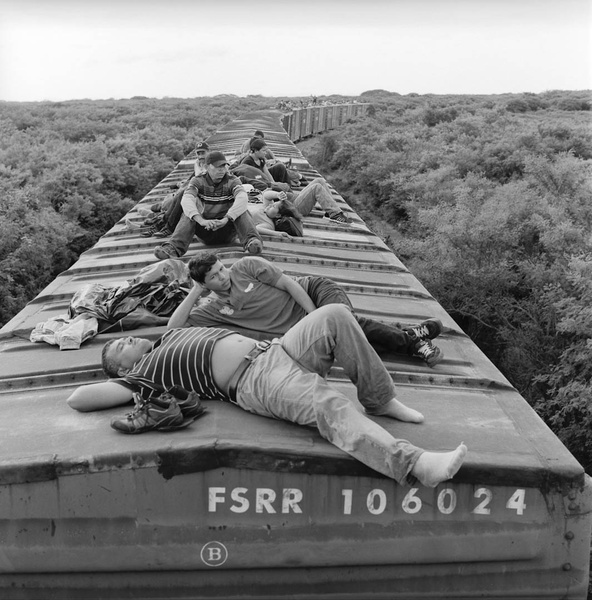 In her Destino portfolio, Frankfurter has photographed the journey of undocumented Central American migrants as they make the dangerous trip through Mexico to cross into the United States. Back in April we presented an interview and new selection of images from Photographer's Showcase artist Michelle Frankfurter. In her Destino portfolio, Frankfurter has photographed the journey of undocumented Central American migrants as they make the dangerous trip through Mexico to cross into the United States. This spring, she used the crowd-funding site Kickstarter to raise the money needed to hire a fixer and complete the project, photographing along the notoriously violent Mexico/United States border. The response to Frankfurter's Kickstarter request was tremendous, allowing her to begin shooting in May, but just as she was getting starting, Frankfurter abruptly had to return to the United States. She wrote about her time in Mexico in a backers-only blog post for her Kickstarter campaign, which she was kind enough to share with us here. I spent a few days in Tucson, where I observed an Operation Streamline proceeding in Federal Court, went on a 10 kilometer hike in the Arizona desert with the Samaritans of Tucson, and generally acclimated to the heat before heading further south to the twin border towns of Nogales, Arizona - Nogales, Sonora. I left the rented Dodge in a lot on the American side and within about 20 minutes of walking over the bridge, I had checked into my room at the Hotel Caribbean - a neglected L-shaped structure squatting in front of a giant construction project. The mottled, stucco facade may have been intended to evoke some kind of Caribbean motif but with its grime-encrusted exterior, it looked more like a medium security prison out of the Nat Geo series, Locked Up Abroad. I visited San Juan Bosco, a migrant shelter wedged halfway up a steep incline where clusters of houses clung precariously to the dusty hillside. There, I photographed migrants from El Salvador, Honduras, Guatemala and Mexico – many of whom had been caught by U.S. Border Patrol as they tried to cross illegally into the United States and were subsequently held in private detention facilities in Arizona before being deported to Mexico. In the region surrounding Nogales, in the Mexican state of Sonora, smugglers, known as polleros continue to operate as semi-autonomous agents. But they must pay a certain percentage of their earnings to the drug cartels that control the business of drug smuggling, human trafficking and the smuggling of undocumented migrants. Along other parts of the border, the drug cartels have either chased out or killed off the polleros in order to fully control the trade. Nothing passes through the desert corridor without the consent of local drug lords. Needless to say, getting any kind of access to this illicit activity is next to impossible. It took eight days, but finally, with the help of my fixer, Jorge, two local journalists and a four-wheel drive pickup we rented from a guy called El Arabe, we succeeded in traveling to Altar, a small town about two and a half hours south of Nogales that is basically a staging ground for illegal immigration. The town's grid is lined with small kiosks and shops selling knock-off brand backpacks, Virgen de Guadalupe memorabilia, bandanas, phone cards, crudely made slippers with pieces of carpeting sewn along the bottom to obliterate footprints, black plastic water jugs – necessary items for making the desert crossing in the suffocating heat. Cheap flophouses offer lodging for a night or two, as migrants await money transfers from relatives. Deals are struck. Eventually, migrants will be packed into one of the many vans parked near the square to be transported along a dusty, rutted road to Sasabe 90 kilometers north, near the Mexico – Arizona border. In Altar, we have breakfast and wait for mass to end at Our Lady of Guadalupe, a colonial era church off the main plaza. In the cramped side chapel, migrants kneel and pray as candles flicker and a framed picture of La Virgen de Guadalupe smiles benevolently. After the mass ends, we talk to the priest. I show him a copy of the Destino book I designed using Blurb – forty pages of images and the lyrics from the Manu Choa song, Clandestino, by now stained and worn from the many hands that have handled it over the course of the week. The priest nods. He taps a number into his cell phone. A quick exchange and we’ve been granted safe passage from Altar to Sasabe. Three hours later, we arrive in Sasabe with our internal organs intact, if not seemingly redistributed. Small shrines to Saint Judas and La Virgen appear alongside the road. The vegetation is practically hostile. Ancient saguaro cactuses brood among the ocotillo and cholla shrubs. In Sasabe, I find a large group of mostly Central American migrants dodging the heat within the cavernous cool interior of a cantina that seems to alternately function as a kind of rooming house. Along the far wall, several migrants rest on grimy mattresses. A crowd gathers. I show them the little Destino book. I take pictures until a man steps inside and tells me to stop. I can see him out of the corner of my eye, about to cross the street and I squeeze off one more frame. And then we get the hell out of there. On the drive back to Nogales, I’m looking forward to the air-conditioned room at the Caribbean, a hot shower and sleep. WIFI. We make it back at 10 PM. There are several urgent messages from my brother telling me to call ASAP and an email from my father with the news that my mother had died. I’m home for a few days, wrapping up the last wedding I shot in early May and gathering up my dogs for the trip back down to Florida to spend some time with my father. For now, the project is on hold until I can get my bearings. I was able to finish shooting in Nogales and had planned on leaving for San Diego and Tijuana the day after returning from the trip to Altar and Sasabe. At some point, hopefully later in the summer I’ll be able to pick up where I left off. We wish Michelle the best of luck and will feature another update after her return in August.